Math.K.CC.A.3: Write numbers from 0 to 20. Represent a number of objects with a written numeral 0-20 (with 0 representing a count of no objects). Math.K.CC.A.1: Count to 100 by ones and by tens. Math.K.CC.A.2: Count forward beginning from a given number within the known sequence (instead of having to begin at 1). Math.K.CC.B.4: Understand the relationship between numbers and quantities; connect counting to cardinality. Math.K.CC.B.5: Count to answer “how many?” questions about as many as 20 things arranged in a line, a rectangular array, or a circle, or as many as 10 things in a scattered configuration; given a number from 1–20, count out that many objects. Math.K.CC.C.6: Identify whether the number of objects in one group is greater than, less than, or equal to the number of objects in another group, e.g., by using matching and counting strategies. Math.K.CC.C.7: Compare two numbers between 1 and 10 presented as written numerals. Math.K.OA.A.5: Fluently add and subtract within 5. 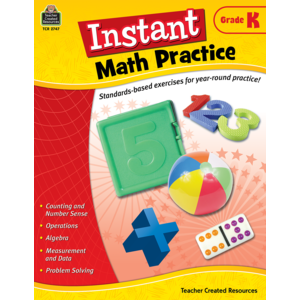 Math.K.OA.A.1: Represent addition and subtraction with objects, fingers, mental images, drawings, sounds (e.g., claps), acting out situations, verbal explanations, expressions, or equations. Math.K.OA.A.2: Solve addition and subtraction word problems, and add and subtract within 10, e.g., by using objects or drawings to represent the problem. Math.K.OA.A.3: Decompose numbers less than or equal to 10 into pairs in more than one way, e.g., by using objects or drawings, and record each decomposition by a drawing or equation (e.g., 5 = 2 + 3 and 5 = 4 + 1). Math.K.NBT.A.1: Compose and decompose numbers from 11 to 19 into ten ones and some further ones, e.g., by using objects or drawings, and record each composition or decomposition by a drawing or equation (such as 18 = 10 + 8); understand that these numbers are composed of ten ones and one, two, three, four, five, six, seven, eight, or nine ones. Math.K.MD.B.3: Classify objects into given categories; count the numbers of objects in each category and sort the categories by count. Limit category counts to be less than or equal to 10. Math.K.G.B.5: Model shapes in the world by building shapes from components (e.g., sticks and clay balls) and drawing shapes.